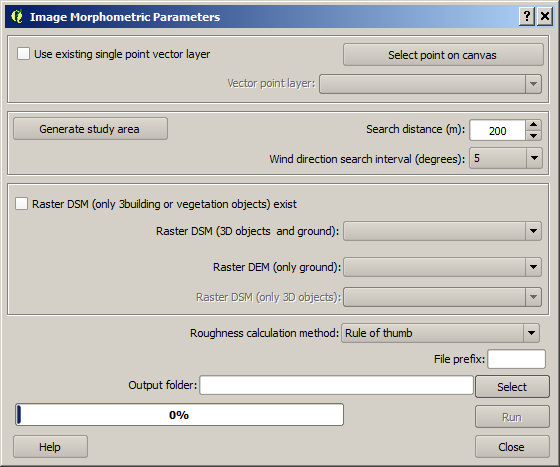 The Morphometric Calculator (Point) plugin calculates various morphometric parameters based on digital surface models. These morphometric parameters are used to describe the roughness of a surface and are included in various local and mesoscale climate models (e.g. Grimmond and Oke 1999). They may vary depending on what angle (wind direction) you are interested in. Thus, this plugin is able to derive the parameters for different directions. Preferably, a ground and 3D-object DSM and DEM should be used as input data. The 3D objects are usually buildings but can also be 3D vegetation (i.e. trees and bushes). It is also possible to derive the parameters from a 3D object DSM with no ground heights. Mean building height (ZH) Average building height measured from ground level [m]. Standard deviation of building heights (ZHσ). Standard deviation of building heights [m]. Plan area index (λP) Area of building surfaces relative to the total ground area. Frontal area index (λF) Area of building walls normal to wind direction relative to the total ground area. Roughness length (Z0) A parameter of some vertical wind profile equations that model the horizontal mean wind speed near the ground; in the log wind profile, it is equivalent to the height at which the wind speed theoretically becomes zero [m]. Zero-plane displacement height (Zd) Height above ground where the wind speed is 0 m s-1 as a result of obstacles to the flow such as trees or buildings [m]. Set the parameters for the area of interest where the morphometric parameters are calculated. Set the search interval in degrees. middle lower Specify the input data regarding buildings and ground. Click on this button to create a point from where the calculations will take place. When you click button, the plugin will be disabled until you have clicked the map canvas. Select if you want to use a point from a vector layer that already exist and are loaded to the QGIS-project. The Vector point layer dropdown list will be enabled and include all point vector layer available. This button is connected to the Search distance (m) and when you click the button a circular polygon layer (Study area) is generated. This is the area that will be used to obtain the morphometric parameters. A raster DSM (e.g. geoTIFF) consisting of ground and e.g. building height (meters above sea level). Options to choose methods for roughness calculations regarding zero displacement height (zd) and roughness length (z0) are available.